As I write this, on April 2, 2016, I am almost done with the June April 1889 issue. I should finish it tomorrow during my greenway hike. I haven’t decided which greenway I’m going to hike on. It’s likely that it’ll be the Leon Creek Greenway, since I’m closer to being finished with that one. I’ve only walked from about halfway between Huebner Road and Hardberger Park to the point where the trail goes under US 281. Update, April 3, 2016: I ended up finishing up the northern end of the Salado Creek Greenway. Now I can say that I’ve walked that entire greenway north from US-281. As I’ve mentioned before, I’m not Catholic. As a Protestant, I don’t believe that Mary stayed a virgin after the birth of Jesus. The “brothers and sisters” mentioned in verses like Matthew 13:55 & 56 and Mark 6:3 are, well, the children of Mary and Joseph. Not Jesus’s cousins. Not the children of Joseph and an unnamed first wife. Therefore, throughout this article, I will strive to always call her just “Mary.” I did grow up in a predominantly Catholic area, so an occasional “Virgin Mary” may slip in. This article focuses largely on apparitions of Mary. 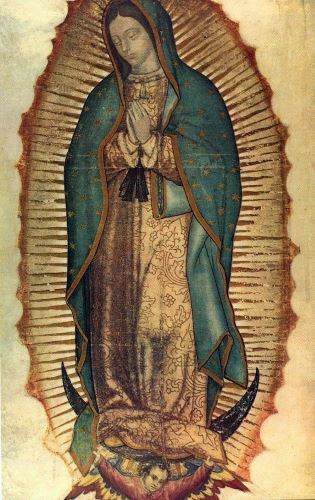 We start in Medugorje, and make mentions of Fatima, Portugal; Kibeho, Rwanda on our way to discuss the “Virgin of Guadalupe,” the 1531 apparition of Mary to Juan Diego (who was canonized in 2002) on Tepeyac Hill in Mexico City. After Mary appeared to Juan Diego, the bishop wanted some proof, so Mary had Juan Diego fill his cloak with roses. When Juan Diego brought the roses to the bishop, the cloak had the image of Mary on it. The cloak has been on display in an series of shrines, churches, and finally, a basilica since then. Orth spends a couple hundred words describing the image, yet there is no picture of it in the article. I took a quick trip down to the Oblate Seminary to visit their Tepeyac Shrine (and also their Lourdes Grotto and the accompanying chapel), then discovered that the Wikimedia photograph I had used as a reference when reading the article was in the public domain, so I’ll be including that (if WordPress will let me upload it. Grrr.). I am pretty proud of the picture of the statue that I took, though, so maybe I’ll use that, as well. One turn of phrase had me wondering about Orth’s religious background. She describes the image on the cloak as perhaps showing Mary “dancing in prayer.” This is not a common phrase. In fact, Google has only around 79,000 hits for the phrase, and at least once, there’s a comma in between “dancing” and “in.” Apparently, she is Catholic, so I wish she had elaborated on that phrase. Orth also discusses the importance of Mary in Islam and we meet Muslim women who go into Christian churches to venerate Mary. Orth also tells about an apparition of Mary in Cairo, Egypt, in the late 1960s and early 1970s. And then we finally get to Lourdes. The Song of Bernadette with Jennifer Jones was one of my favorite movies when I was growing up (I seem to recall that they used to show it every Easter on WGN). When we were moving during my childhood, we kept the stuff that we didn’t want the movers to handle in a self-storage place that backed up to I’m-not-even-sure what. A kind of unkempt marshy area. I used to like to visit it and never quite understood why until my mom pointed out that it looked kind of like the grotto from the movie. So I quite liked this part, though I was still kind of annoyed at the lack of images of the Virgin of Guadalupe that I didn’t like it as much as I should have. I wasn’t sure what to expect of this article, since I’m a “nontaster.” Stuff like mayonnaise and sour cream tastes nasty to me, as do wine and cilantro. As a result, I’m far more motivated by texture than by flavor. I don’t like the texture of fat in my mouth, so when the low-fat diet became a “thing,” it was wonderful. I could order chicken without the skin or other lean protein choices without seeming like a “picky eater.” I could order things without the heavy cream sauces or avocado and the waiter would just chalk it up to attempting to be a healthy eater. Owen assumes that everyone experiences broccoli as bitter, but I don’t. I’m highly motivated by my sense of smell, so while I quite like raw broccoli, I don’t eat cooked broccoli at all. Cooking brassicas (broccoli, cauliflower, cabbage, etc.) releases sulfur compounds which makes them smell bad. Anything that smells like that will never make it past my nose. I have one co-worker whose daily lunch of microwaved broccoli nearly drove me from our break room more than once. Aside from the anti-broccoli bias, the article is pretty even-handed. It mostly talks about the relatively recent discovery that the tongue really has the same kinds of taste buds all over it (as opposed to the mapped out areas that people of my age learned about in school) and that we have two senses of smell — the one that comes through our noses and one that comes up the back of the nasal cavity. The smells that go up the back of the nasal cavity register in the same part of the brain that registers taste. Owen talks about sweetness a lot, and this is another place where I am an outlier. Artificial sweeteners (including sucralose) taste bitter to me. The only non-sugar sweeteners that taste good to me are the sugar alcohols such as mannitol and xylitol. Fortunately, I don’t seem to be subject to the digestive distress that some experience from sugar alcohols. My now-ex, Alex, and I all took an actual test to determine our taster gene status. I bought testing papers from a scientific supply company and everything (this is why I can say for certain that I’m a nontaster). Alex is a supertaster and his tastes and mine are much closer than either of ours with his dad (who is a regular taster). Alex actually prefers things a little blander and lower-fat than I do, even.